Fat: Fat should not necessarily be avoided, but it is important to keep it in check. Fat provides essential fatty acids, which are not made by the body and help to control inflammation, blood clotting and brain development. Fat serves as the storage unit for extra calories. There are three types of fat. Unsaturated fat is good for the heart and usually can be found in liquid form at room temperature, like olive oil. The other types are saturated fat and trans fat, which should be monitored more closely. Saturated Fat is usually found in meat and dairy products. While you are encouraged to consume some saturated fats, high levels have been known to cause heart disease. Trans Fat is the worst offender and should be avoided at all costs. Trans fats are man-made and have been linked to diabetes, heart disease, cardiovascular diseases and other still emerging health risks. There is no benefit to consuming trans fat. 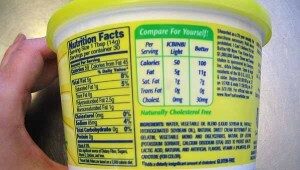 If you see “partially hydrogenated oil” on an ingredients list, the food contains trans fat—even if the trans fat % DV (percent of your daily value—see below) says zero. Cholesterol: Cholesterol is important in controlling your hormones, but too much cholesterol in the blood can damage arteries and cause cardiovascular disease. Sodium: Sodium regulates blood pressure and blood volume in the body. Healthy adults should limit sodium intake to 2,300 mg per day while those with high blood pressure should keep it to no more than 1,500 mg per day. Total Carbohydrates: Carbs get a bad rap, but not all are bad for you. Carbs are your body’s No. 1 source of energy! There are two types of carbs: processed and whole-grain. Whole grains contain more fiber and nutrients and will regulate your blood sugar, keeping your energy and appetite levels stable, making them a healthier choice. Processed carbs are burned up quickly, spike your blood sugar and leave you hungry soon after, making them a carb to avoid as much as possible. While the Total Carbohydrates won’t tell you which can be found in your food, it will tell you how many grams there are per serving. To find out if your food contains whole grains, check the ingredient list. If the first word in the list—the very first word—is whole, you are consuming whole grains. If the first ingredient says enriched or bleached, it is a processed carb, will leave you hungry sooner and offers little nutrition. Dietary Fiber: Fiber is indigestible, but helps the digestive process run smoothly. Food high in fiber, due to the inability to be digested, also helps you stay fuller, longer. Sugar: There are two types of sugars: natural sugars, which occur naturally in foods like fruit and dairy, and added sugars, ones that are added to foods to change the taste. Over consumption of sugar is linked to an increased risk for obesity, high blood pressure, type 2 diabetes and dyslipidemia (high cholesterol, high triglycerides, low HDL cholesterol and/or high LDL cholesterol). It is recommended that women limit added sugar intake to 100 calories, 24 grams or 6 teaspoons and men to 150 calories, 36 grams or 9 teaspoons. Protein: Protein helps to facilitate muscle repair and growth. It is recommended that adults consume .8 grams of protein for every pound of body weight. Vitamin A, C, Calcium and Iron: Simply put, these are vitamins and minerals nutrients your body needs to run properly. Vitamins and minerals are found in the foods we eat, and some foods are more dense with vitamins and minerals than others.